Here is Mr. Ishida's system. He is well-known craft master. 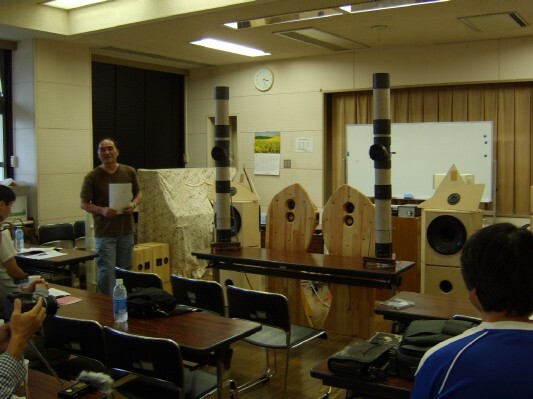 He brought standard 2 way bass-reflex system. Though his work was standard 2 way, there was no contaminated sound felt to me. I am sorry that there was no proper stands, my work was used as system stand. His standard 2 way regenerated excellent sound. We have to always come back to basics. It was what his work let me know. 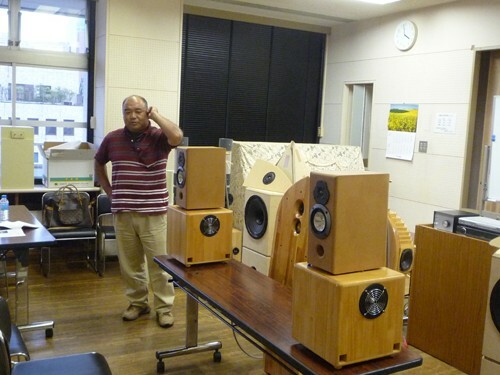 Mr. Furudate brought 4" co-axial 2 way speaker system. Cabinet type was standard MCAP-CR. Material of cabinet is vinyl pipe. This made its sound more vivid. His system generated vivid sound. It was tuned to fit pops sound rather than classical musics. Frequency range was wide enough from very low (40Hz and lower) to very high (may be 20kHz).